We, at the Backyard Wildbird and Nature Store, would like to thank you, Linda and Dudley, for opening your yard to the more than fifty birders who viewed this “spunky” little Warbler in the past week and one half. Understandable, Linda and Dudley would like to get back to their normal pace of life and so have decided that New Years Day, Tuesday January 01, 2008, will be the last viewing day for birders to access their yard. What a great way to end a birding year—thank-you again! If you have any questions, please contact the Backyard Wildbird and Nature Store at (250) 390-3669. The Black-throated Blue Warbler continues to visit the suet feeders in Nanoose Bay. 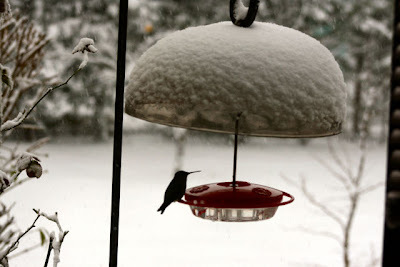 For information call the Backyard Wildbird & Nature Store at (250)390-3669. Red Crossbills were seen high in the fir trees near the Bird Store along Metral Drive in north Nanaimo. Canada Goose, Anna's Hummingbirds, Northern Flicker, Northwestern Crow, Common Raven, Chestnut-backed Chickadee, Golden-crowned Kinglet, Bushtits, American Robin,, Varied Thrush, European Starling, Spotted Towhee, Song Sparrow, Dark-Eyed Junco, House Finch, Pine Siskin, and House Sparrow along Lancashire Avenue in Nanaimo. An immature Golden Eagle was spotted flying over Duncan. A Townsend's Warbler is coming to suet feeders along Boundary Crescent in Nanaimo. 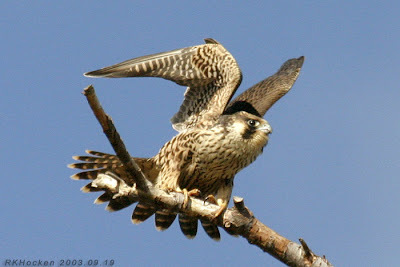 An American Kestrel was seen perched on the hydro line near the Ugly Dwarf Meadows in Nanoose Bay. A Cackling Goose was seen in among the Canada Geese at Parksville Community Park. A Great-horned Owl was spotted along Viking Way in Columbia Beach. A male Anna's Hummingbird is feeding along Colbourne Drive in Nanaimo. 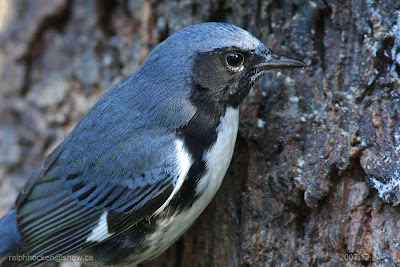 The Black Throated Blue Warbler along with Northern Flickers, Downy Woodpecker, Varied Thrush, Dark-eyed Juncos, Chestnut-backed Chickadees, Spotted Towhees and Red-breasted Nuthatch are coming to suet feeders in Nanoose Bay. For more information and access please call The Backyard Wildbird and Nature Store at 1(250) 390-3669. A Peregrine Falcon was spotted high on a snag at the Nanaimo Golf Course. Monday January 28, 2008@ 7:30 pm. The Sunday Bird Walks will resume in the New Year. Black-throated Warbler at Nanoose Bay: Ralph Hocken Photo. The Black-throated Warbler continues to visit the suet feeders in the 2400 block of Cross Road in Nanoose Bay. The propery owners are welcoming birders to their yard after 9:30 am. Call the Backyard Wildbird & Nature Store at(250)390-3669 for directions to the property. WISHING EVERYONE A VERY MERRY CHRISTMAS AND A PROSPEROUS BIRDING NEW YEAR! FROM THE GANG AT THE BACKYARD WILDBIRD & NATURE STORE. RARE BIRD ALERT" BLACK-THROATED BLUE WARBLER"
Greater White-fronted Geese at Parksville: John Purves Photo. A Chukar was seen near the airport at Qualicum Beach. 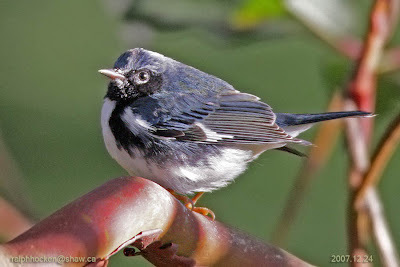 A Black Throated Blue Warbler is coming to feeders in the 2400 block of Cross Road near the library in Nanoose Bay. A Merlin, a Downy Woodpecker, a Spotted Towhee, Dark-eyed Juncos and Chestnut Chickadees are visiting a backyard along Garibaldi Drive in Nanaimo. Red Crossbills were seen at the top of Fir Trees near the Bird Store off Metral Drive in north Nanaimo. A flock of American Pipits were heard as they flew over the Backyard Wildbird & Nature Store in Nanaimo. A Barred Owl was seen in the Hospital area in Nanaimo. Twenty Cackling Geese were seen in with a large flock of Canada Geese at Somenos Marsh in Duncan. Two Varied Thrush were seen in Shelly Creek Park behind Farrell Drive in Parksville. A Downy Woodpecker is visiting suet feeders in the 2000 block of Cedar Road in Cedar. 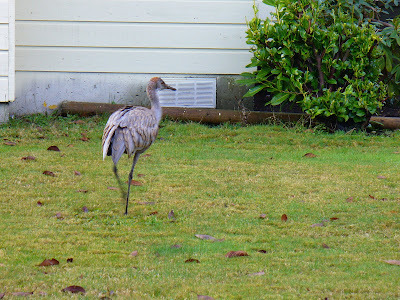 A Sandhill Crane was seen along Hammond Bay Road in Nanaimo. 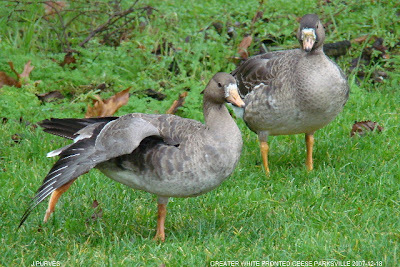 Two Greater White-fronted Geese and a Cackling Goose were seen at the Parksville community center at Parksville Bay. A White-throated Sparrow was seen near Green Lake in north Nanaimo. A Double-crested Cormorant was seen on a log at Westwood Lake in Nanaimo. A Downy Woodpecker was seen at Longwood Estates in Nanaimo. The Wednesday Bird Walks will resume in the New Year. This Sandhill Crane has been seen in the Pipers Lagoon area(off Hammond Bay Road) for the past week. Two Great Horned Owls were seen in the 1100 block of Morrell Circle in Nanaimo. A Townsend's Warbler was seen visiting suet feeders in the Seabreeze Mobile Home Park near Beck Creek along Maki Road in south Nanaimo. A Sandhill Crane was seen at the corner of Kite Way and Osprey Lookout in Nanaimo. Twelve Northern Fulmars, four of which were the northern sub-species white phase, rare in this area were seen off Gordon's Beach near Sooke. RARE BIRD ALERT "PARAKEET AUKLET"
the water. Please do not get too close to the water as large waves come into the lower areas and can sweep a person out to sea in seconds. 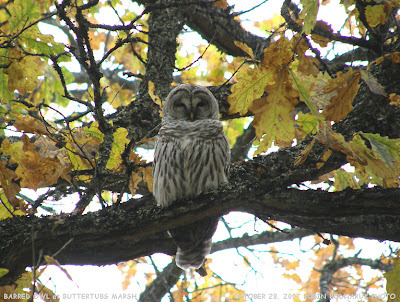 A Barred Owl was calling in the Colliery Dam Park off Harewoods Minds Road in Nanaimo. A Townsend's Warbler was seen at suet feeders along Kenwill Drive in north Nanaimo. A winter plumage Yellow-billed Loon, two Barrow's Goldeneye, two Horned Grebes, a Common Merganser, two Bufflehead and a Pied-billed Grebe were seen at the Schooners Cove Marina in Nanoose Bay. The Loon was seen about ten feet from the road looking towards the boat basin. A Eurasian Wigeon was seen on the golf driving range in Duncan. A Barred Owl was seen near the north parking lot at Buttertubs Marsh in Nanaimo. 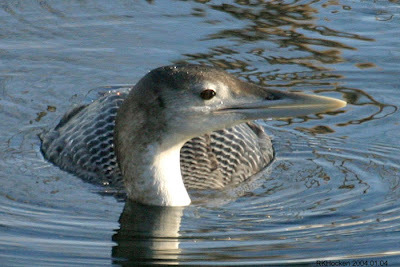 A winter plumage Yellow-billed Loon was seen at the Schooner Cove Marina at Nanoose Bay. The Loon was seen just off the road looking towards the boats in the Marina. Also there were a pair of Barrow's Goldeneyes, two Horned Grebes, a Common Merganser, two Bufflehead and a Pied-billed Grebe. A Sandhill Crane was seen at the sharp turn of Hammond Bay Road just up from Pipers Lagoon in Nanaimo today. The Sunday Bird Walk went to Buttertubs Marsh in Nanaimo. Among the highlights were the sighting of a Merlin chasing a large flock of Pine Siskins, one Red-tailed Hawk perched in a tall fir tree and, at the end of the walk, we saw eight Cedar Waxwings in a berry tree next to the Bowen Road entrance. Eleven birders found the following thirty species: Great Blue Heron, Canada Goose, Gadwall, Green-winged Teal, Ring-necked Duck, Mallard, Hooded Merganser, Merlin, Red-tailed Hawk, Glaucous-winged Gull, Northern Flicker, Rock Pigeon, Northwestern Crow, Steller's Jay, Bewick's Wren, Red-winged Blackbird, American Robin, Ruby-crowned Kinglet, California Quail, European Starling, Cedar Waxwing, Spotted Towhee, Song Sparrow, Golden-crowned Sparrow, American Goldfinch, Pine Siskin, Dark-eyed Junco, Purple Finch, House Finch and House Sparrows. A Townsend's Warbler, a Wilson's Snipe, a Lincoln's Sparrow and a flock of Cedar Waxwings were seen in the woods at French Creek. A Common Murre was seen at Stones Marina next to the Muddy Waters Pub in downtown Nanaimo. A Cook's Petrel was found on a front porch in Lilllooet in the Coast Mountains on the mainland. The Cook's Petrel nests on Islands near New Zealand in the south Pacific. Two Varied Thrush were seen at a ground feeder in Boat Harbour in Cedar. An American Kestrel was seen at the top of a tree at the Ugly Dwarf Meadows in Nanoose Bay. A Silver Pheasant was seen off Bayshore Drive towards the Ocean in Nanaimo. Seven Northern Flickers, including a yellow-shafted Northern Flicker, along with Song Sparrows, Dark-eyed Juncos and Spotted Towhees were seen along East Wellington Road in south Nanaimo. A Townsend's Warbler was spotted in the trees at French Creek. There will be no Sunday Bird Walk on December 16, 2007. The Sunday bird walk was cancelled. An Anna's Hummingbird is visiting feeders along Victoria Road in south Nanaimo. An albino Dark-eyed Junco was seen in with other Dark-eyed Juncos along Mill Road near Westwood Lake in Nanaimo. Ten Trumpeter Swans were seen over Parksville heading south west. A Sandhill Crane landed in an empty lot along Bayshore Drive in north Nanaimo. A Tropical Kingbird seen at 11:00 am to-day in the 7700 block of Anderson Drive on Hornby Island. The Kingbird was eating berries from a bush. Common Loon, Pacific Loon, Double-crested Cormorant, Great Blue Heron, Horned Grebe, Red-necked Grebe, Surf, White-winged and Black Scoters, Greater Scaup, Harlequin Duck, Barrow's and Common Goldeneye, Red-breasted and Common Merganser, Bald Eagle, Merlin, Mew Gull, Thayer's Gull, Glaucous-winged Gull, Northern Flicker, Northwestern Crow, Chestnut-backed Chickadee, Red-breasted Nuthatch, Golden-crowned Kinglet, Bewick's Wren, American Robin, Northern Shrike, Spotted Towhee, Golden-crowned and White-crowned Sparrow, Dark-eyed Junco, Red Crossbills, Purple Finch, Pine Siskin, American Goldfinch. Monday, December, 2007@ 7:30 pm. There will be no Wednesday Bird Walk on December 05. The Wednesday Bird Walks will resume in the New Year. The Sunday Bird Walk on December 09, 2007, will be going to Buttertubs Marsh in Nanaimo. Meet at the Birdstore at 9:00 am or at the parking area off Bowen Road at about 9:20 a.m.